Guest designing for Paru’s Challenge Blog! 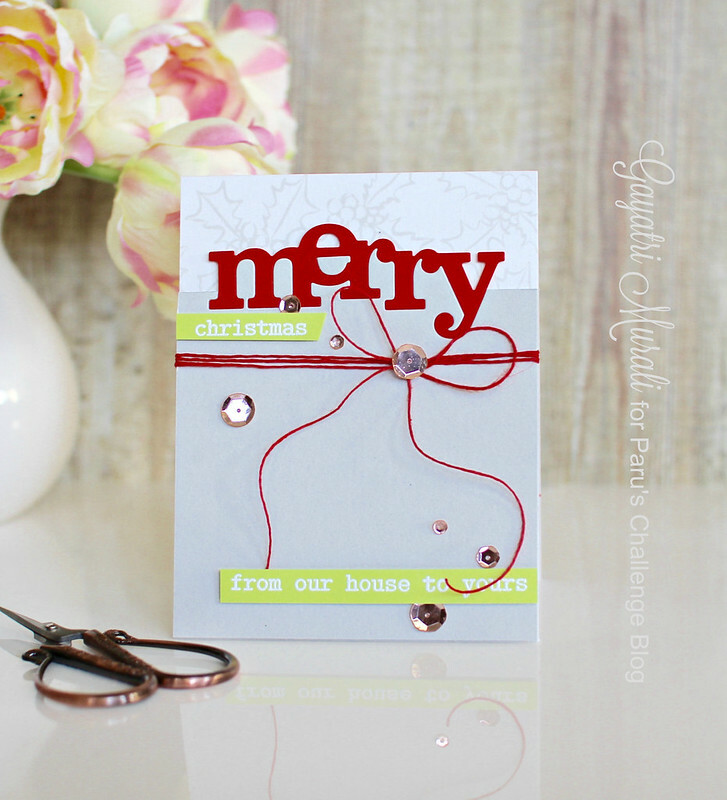 I am so happy to share that I am Guest Designing for Paru’s Card Making Challenge Blog this month. This month’s challenge focuses on words. And this is my take on the challenge. And I made both the card and coordinating tag. 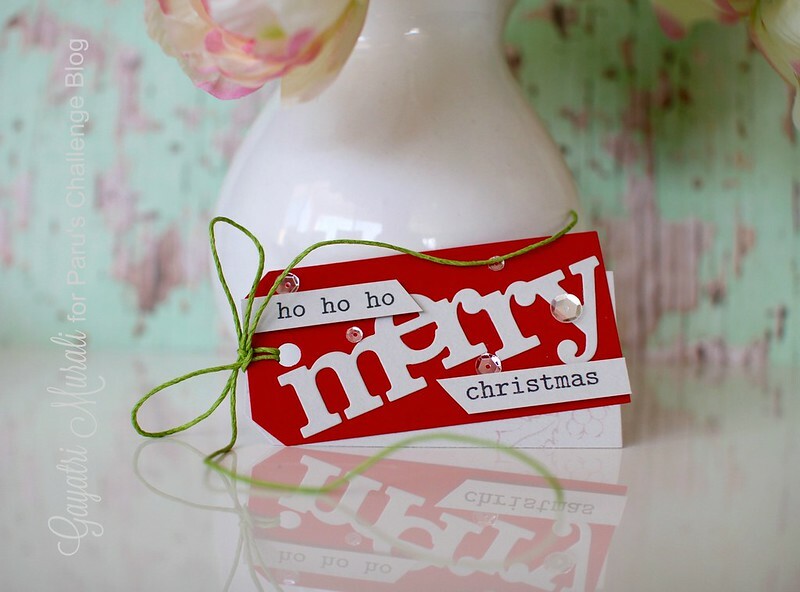 I have made Christmas card and tag with focus on the sentiment. My card base is white and I stamped Christmas image from Winnie & Walter’s In Bloom: Elsa’s Flora stamp set using Fog ink from Simon Says Stamp only on the top of the card front. Then I die cut the In a Word: Merry from Winnie & Walter on Fog cardstock panel. I saved the Merry die cut for the tag. On the negative of the panel, I trimmed the panel from half of the negative Merry to the top. Then I inlaid the die cut Merry die cut using red cardstock. I wrapped red twine around this panel and tied a bow. I adhered this panel on the card front using foam adhesives. The secondary sentiment are from Winnie & Walter’s The Big, the Bold and the Merry stamp set. I white heat embossed the sentiment on green card stock strip and adhered as shown in the picture. Rose gold sequins from Pretty Pink Posh completes the card. 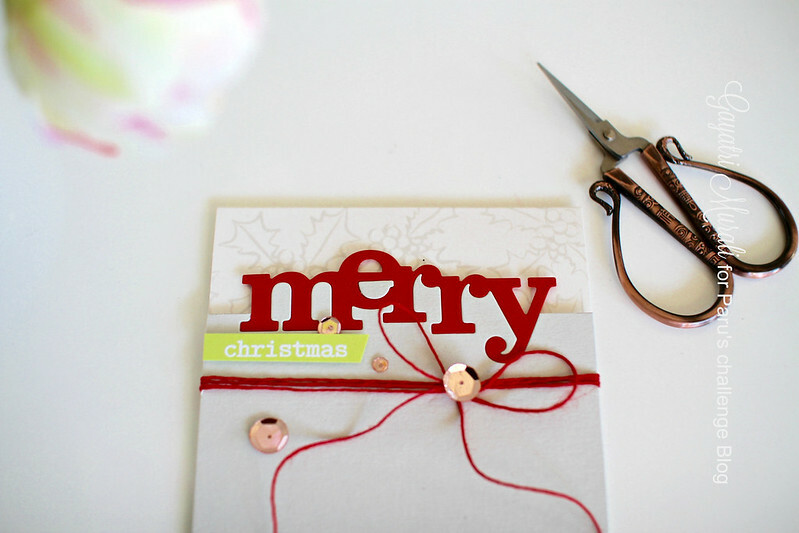 I used the saved up fog coloured Merry die cut to make coordinating tag for the card. 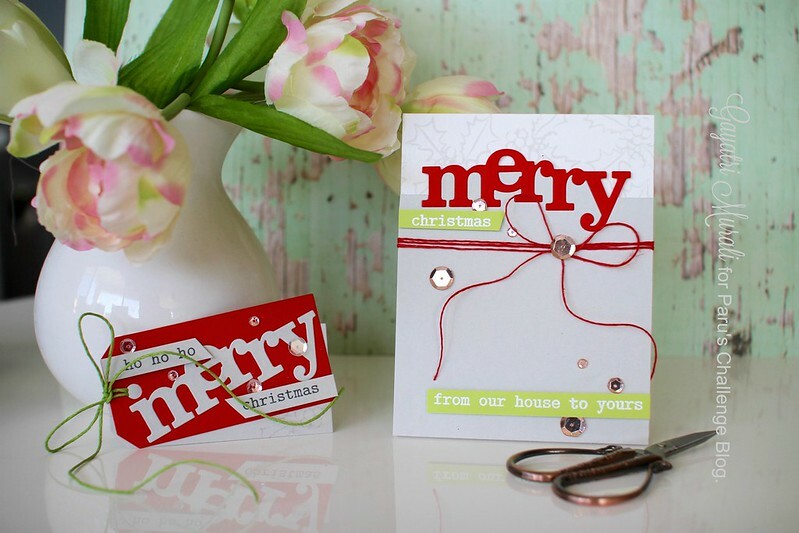 The tag is die cut using fog and red cardstocks. The tag die is from Winnie & Walter’s Essentials: Katharine Cutaway. I stamped the same image I stamped on the card on the fog tag using Lipstick Red ink from Simon Says Stamp. I layered the red tag over the fog tag and used a green twine to tie them together. 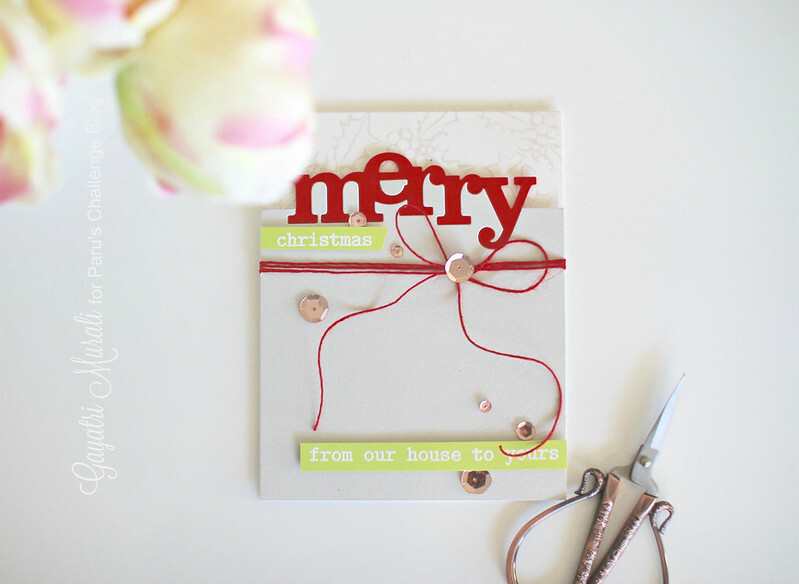 I adhered the fog coloured Merry die cut saved from the making of the card on the red tag at an angle. The secondary sentiments are again from Winnie & Walter’s The Big, the Bold and the Merry stamp set. I simply stamped them on fog cardstock strips in black ink and adhered as shown in the picture. Finally, the Sparkly Clear sequins from Pretty Pink Posh completes the tag. Here is both the card and tag together. So this is my take on the challenge: Focus on Words! The words and colours make this card a Perfect Christmas card in spite of not have a Christmas themed focal image on the card. Hope you are inspired by my card. Now its your turn to play along. For more details on how to play the challenge, please visit Paru’s Card Making Challenge Blog.